Imagine, for a moment, that you’ve just heard a terrible sentence. Four terrible words, but you haven’t heard anything yet. “Lung” is merely where the cancer lives—like a country, or even a whole continent. “Cancer” is not a single disease—it’s a blanket word for myriad ways that cells can go wrong. One small defect in a single gene sequence is enough to make cells multiply out of control. It’s important to know which one is affecting you. A sampling of cells is sent off to a pathology lab, and more precise words come back. Adenocarcinoma, non-small cell lung cancer… it’s all a blur to you. Through gene sequencing, your mutation is narrowed down to a specific site. Now you have a label for your cancer: EGFR T970M. Even if your doctor translates some of that (EGFR stands for “epithelial growth factor receptor”) it’s still just a jumble of letters and numbers to you. To an oncologist, it’s like GPS coordinates—a precise location that can be targeted by a “personalized” therapy—if only your doctor can sort through the massive heaps of scientific research that is published every day and zero in on the information that could help you. Sitting in a sleek office along the steel-and glass spiral of The Jackson Laboratory (JAX), in Farmington, Conn., Sue Mockus opens her laptop and demonstrates how hard it can be to pinpoint the right information. She types in your mutation—EGFR T790 M—and instantly gets 1,419 hits on the Pub Med database. Google Scholar returns more than 20,000 article titles. “Your doctor doesn’t have time to read through all that,” she states flatly, in her no-nonsense manner. Mockus then runs the same search the independent, nonprofit biomedical research organization’s genomic database—the JAX-Clinical Knowledgebase. It’s her baby, so she gets to call it by its pet name—CKB. This time, the screen displays an orderly grid that racks up the relevant results by category. There’s detail on the known cancer gene variants, and links to targeted treatment options. By clicking on the “Efficacy Evidence” tab, your doctor can find out which drugs are FDA approved, which are in clinical trials, and which trials might be open to patients like you. Recently, Mockus’s dream job went to the dogs—in a good way. Last year, an anonymous donation enabled JAX to expand its work with Tallwood Canine Cancer Research Initiative. With deadpan humor, Mockus reenacts the moment when her boss, Charles Lee, approached her with a formal request to utilize the CKB in the canine research project. Canine cancers share many similarities with human, and some cancers that are rare in humans are more common in dogs, which yields a larger sample pool for her work with the work with Tallwood Canine Cancer Research Initiative. Here Mockus stands with her own rescue dog Molly. Mockus knows the pain of canine cancer well. Her first dog, back in her postdoctoral days at the University of Washington, was Georgia, a fox terrier who was prone to mast cell tumors. There were numerous biopsies, always an ordeal for both pet and owner. She dreamed of developing a simple diagnostic blood test. 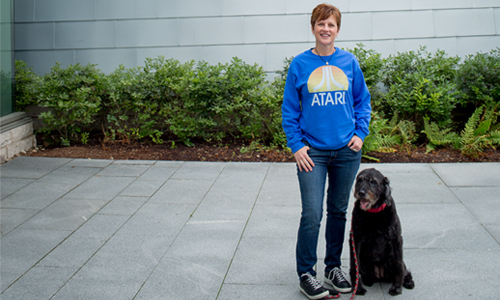 When the Tallwood Canine project came along, it was a dream opportunity to be part of research that could benefit the people and the dogs in her life. Georgia was a named for Georgia O’Keefe. Mockus’s current rescue dogs are all named for artists: [Andrew] Wyeth, [Ansel]) Adams, and Sophie [Pemberton]. What moves a biotechnology major/MBA with a PhD in pharmacology and neuroscience to name her dogs for those masters? Not many schools had a biotechnology program in the early 1990s, and that’s what drew her to WPI. Work within her major served as stepping stones for her career. She interned at Collaborative Research in Waltham, Mass., known for pioneering work on the human genome. Her MQP there created a database for forensic testing, based on DNA analysis. “Susan took my Cell Biology and Advanced Cell Biology classes,” says Professor Dave Adams, “where we explore DNA fingerprinting techniques, among other topics.” Research articles form the basis of this class, and it was here, and in a student club that Mockus learned to decipher scientific papers. Asked what draws her to genetics, she again refers to the challenges of deciphering a cryptic language. Founded in 1929, the Jackson Laboratory (jax.org) is an independent, nonprofit biomedical research institution. Its mission is to discover precise genomic solutions for disease and to empower the global biomedical community through curation of data and provision of critical research models and services—including 10,000 strains of genetically defined mice.